InstaScreen™ is our cutting edge, cloud based platform. Our InstaScreenTM platform is secure, and constantly updated to help us, and you, comply with new legislation on the national, state, and even city level. InstaScreen uses Encryption, Multi-factor authentication and is PCI and EI3PA Certified. We can integrate with your system. We integrate with dozens of leading Applicant Tracking Systems as well as Property Management Systems, and the list continues to grow! Our QuickAppTM feature saves you time and effort by allowing the applicant to provide their information and sign all authorization and disclosures electronically. It reduces your workload and simplifies the steps involved in ordering and staying compliant with the FCRA. InstaScreenTMour cutting edge, cloud-based platform gives you 24/7 access for ordering, viewing, and monitoring your reports. Our platform is secure, and constantly updated to help us, and you, comply with new legislation on the national, state, and even city level. InstaScreen uses Encryption, Multi-factor authentication and is PCI and EI3PA Certified. We integrate with scores of Applicant Tracking Systems and the list continues to grow. 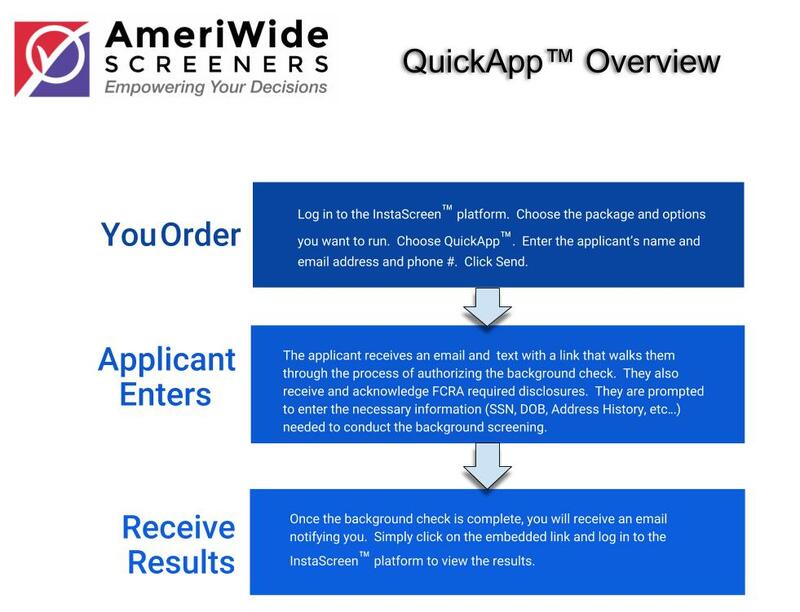 Our QuickAppTM feature saves you time and effort by allowing the applicant to provide their information and sign all authorization and disclosures electronically. It reduces your workload and simplifies the steps involved in ordering and staying compliant with the FCRA. Below is a video and diagram overview of the QuickAppTM process. In addition to our QuickApp™ capabilities, our platform currently integrates with many Applicant Tracking and Property Management systems. We are constantly working on additional integrations. If your platform isn’t listed below, contact us! We are constantly looking for additional integration opportunites.